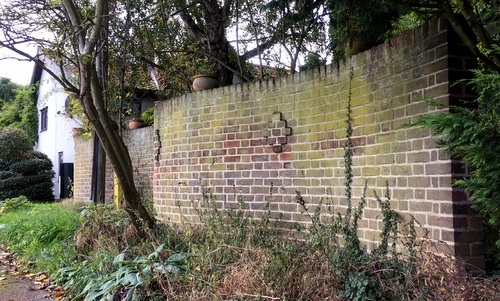 Rural architect Juliet, who'd already tipped me the wink about Reydon, was the first to mention a wall at Herringfleet Hall. Where? We're talking the north-eastern corner of Suffolk, perilously close to N*rfolk. Several false starts later, I discovered that the hall is now within the remit of the mahoosive Somerleyton estate. Gosh. Paul, helpful chap from the estate office, explained that Somerleyton encompasses over 100 properties spread around 5,000 acres. Like I say, hoooge. The C18 Grade II listed hall is off the fantastically named Blocka Road and is home to private tenants who rent it from the estate. Past the tennis court and through the doorway into what appears to be a secret garden. Either side has an enormously tall (12 feet?) brick wall, each dead straight. Previously grand greenhouses sit unloved in the corner. Much of the walled garden, like one or two others we've seen, is overgrown. 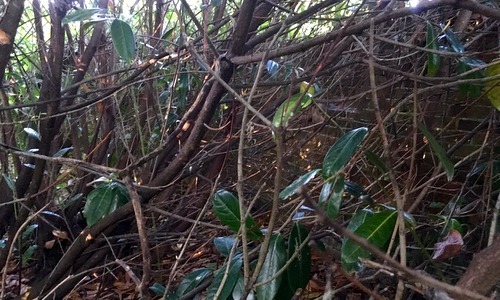 Our crinkle-crankle wall is to the rear, somewhere behind that mass of undergrowth, and there's no easy way to reach it from inside the garden. As Paul says, it's been a good growing year. Change of tack as we exit and head directly around the back. There, through the undergrowth, we could just about glimpse a giveaway curve. I tried to get closer a little further round but to no avail. It's a jungle in there, literally. 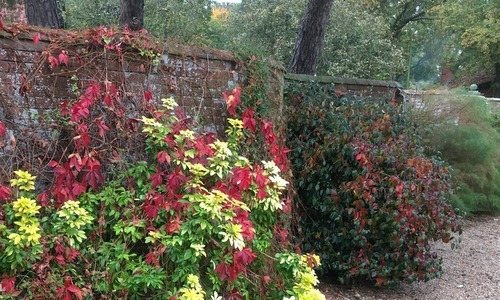 Paul says they're planning to tidy the garden and remove the foliage soon, hopefully by the end of the year. Once that's done, I'll be back. "Hi, this is Radio Suffolk. I know we had you on earlier this year talking to Lesley Dolphin. 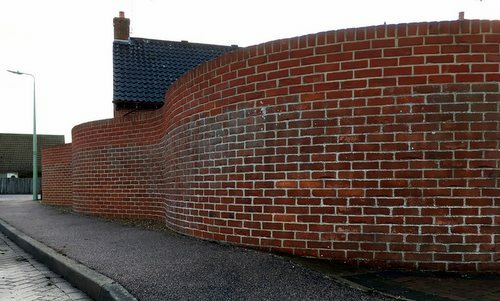 Well, this afternoon we're talking to a man who says he's built the first crinkle-crankle wall in Suffolk for 100 years. Are you free to come on?" Sadly, I wasn't, else I'd have most likely mentioned the walls at newly constructed walls at Ashbocking, Brantham, Harleston, etc. There's a handful about, plus the likes of those built into modern estates at Eye, Reydon, etc. All that aside, always glad to hear about fresh examples especially since (whisper it) the end of the list is approaching. To Bury, left past Ickworth and straight on until Stradishall where, on the main A143, we find Woodfarm Cottage. Go to Google StreetView (dated 2011) and we see a plain wooden picket fence in front of a tall hedge. 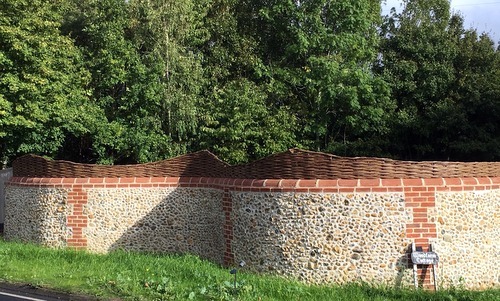 That's now been replaced by a short length of flint-decorated crinkle-crankle topped with pleasingly rounded brick and the whole thing surmounted by undulating wicker from Woven Worlds. Good outdoor skills by local gardener and craftsman Graham North. Quicky mention for a kickbutt coffee and massive fruit slice at the rather good Depden Farm Shop down the road. Through Brome motor the Brooms when Mrs Broom notifies Mr Broom that they've just passed a wavy wall. You mean the one round the back of the Brome Grange, says the mister? Nope, says the missus, a little further on. Cue a swift U-ey at the Devils Handbasin garage. Past the Swan then another about-turn to park in a handy lay-by, and here's the curiously labelled Oak Tua Cottage. As usual, she's right, darn her, for to the right of the driveway stands a brief stretch of crinkle-crankle. Probably built within the last 30 years, terracotta pots are dotted along the top and a telegraph pole sits in one of the bends. Not getting too technical but the wall also features some sticky-out bricks in a diamond formation here and there. Starting to age nicely, let's hope it stays a while. Would love to know a little bit of history, if anyone can help out. Another week, another tip. Psst, said the message, get thee to Puddingmoor. I try not to heckle Beccles and it's many months since our extended family outing to Hungate Lane but return we must. 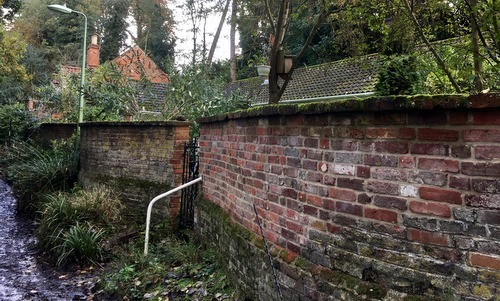 "...a row of single storey cottages with only roofs visible behind a wonderful curved crinkle-crankle wall"
A route march from Fen Lane car park past the Waveney House Hotel and the lido eventually brought us to the weaving roadside wall. A good hundred years or more old, it's a chunky relic of things past with a gateway leading to said cottages. One end looks to join a right-angled wall of a similar age while the other end has been grafted on to a newer support. Puddingmoor: what a name. 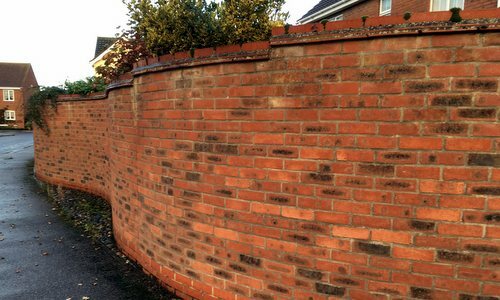 Busy Bing-ing Beccles, out popped a reference to another unvisited wall. Up Cliff House Steps, past the undulating Hungate Lane -- sorry, passing Beccles lady, no time to stop -- and via Station Road into narrow Gaol Lane. Halfway along is the Caxton Club. They've a function room to hire, if you're interested. 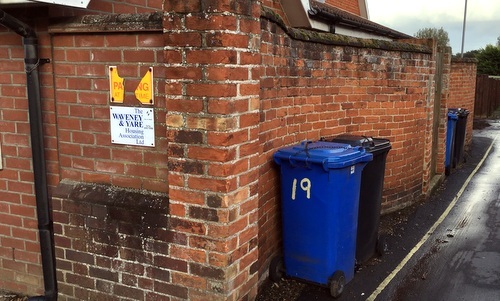 Guarded by two pairs of blue and black wheely bins which are actually chained to the structure (a first) is a wall, perhaps of a similar vintage to Puddingmoor and almost certainly newer than the social club behind. Couple of crinkles, couple of crankles, job done. Reassuringly vintage and a bit of an oddity. That completes the hat-trick of new sitings for today, hoorah! Approaching Woodbridge after a productive day at Beccles, I make a suggestion. Could we make a slight diversion down the A1152 near Melton Hall? Friend Andy, Eco Warrior and ping-pong machine, has been kind enough to point out a brand new wall possibly still under construction. It's on Pytches Road, he said, and sent me a video to prove it. I know. Turn right nearly opposite the old council offices and waddya know, here's a minty fresh crinkle-crankle with the mortar still drying. 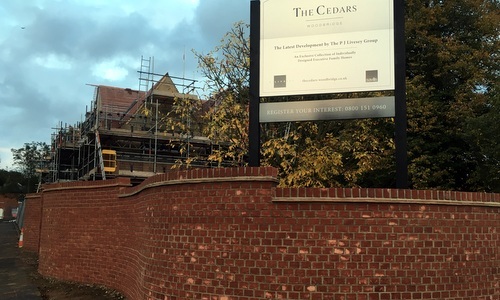 Big board says this is The Cedars, "the latest development by the PJ Livesey Group", and while it's still a building site to the rear, they've done a top job with a stepped wall descending around a corner. Nice curves, nice finish, and protected by four traffic cones to keep away the riff-raff. Taking a chance and with the light beginning to fade, me and the mother called by on spec and, happily enough, were met by a charming couple busy in their garden. Absolutely took in their stride my mutterings about tracking down such structures, and in fact remarked that someone had come by to make the same enquiries about 10 years back. Seemingingly in good nick, their fine old wall sports some autumnal foliage with a decent number of crinkles and crankles. The house itself predates the wall and, despite being a rectory, is a mile from the church. It's said that the vicar was given a lame donkey, didn't make it to the church in time and so somebody else gave the sermon. Thanks to the Hinderclay hosts for their hospitality. All Mr Google could tell me about this dwelling was that it had been the subject of a watercolour or drawing by KG Elwood in an exhibition by the Lowestoft Art Group in 1960. Yet not a trace of it in the modern day. Until, that is, I spoke to local resident Gerald Brown the other day, or rather his very helpful wife. Grove House? That'll be Livingstones on White's Lane, she told me. I can only assume that the original Grove House was either demolished at some point or radically remodelled into the current pub stroke restaurant. 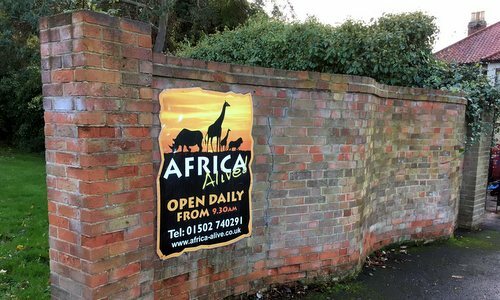 Either way, there, right there at the entrance to Africa Alive is a bijou length of crinkle-crankle. Doesn't look especially aged and perhaps built as a reminder of things past, it even wears an authentic top to bottom crack. While bothering the patient staff of Kessingland library, a lady happened to mention that, while she couldn't help with Grove House, she did know of one or two modern walls in the village. Two minutes walk from White's Lane, past the curious "Kessingland residential area" sign, brought us to Heritage Green. As the road curves to the right, there's a very modern sinuous wall, slightly stepped on top, with a distinct crankle. No sooner had I taken my snaps and turned around than I saw another on the other side of the road at the entrance to Ark Close. Clearly it was buy one get one free at Crinkle-Crankles 'R' Us when this estate was constructed. So as well as Heritage Green, continued the lady librarian, there's a new wall in Badger's Holt. Well into Midsomer Murders territory now, methinks. Half a mile along from Livingstones, with the brutalist water tower on the right, White's Lane morphs into Church Road. Here's that turning into Badger's Holt where lo & behold we find a rather nice single brick and single height sine wave. Starts alongside the house, does a couple of shimmies then finishes by the garage, pure and simple. In another 2-for-1 deal, there's another modern wall attached to the house on the other side which largely faces on to Church Road. Let's not count that as a separate one, being so close to the other. Still not quite done, we followed the last librarian tip-off up The Avenue. A none-too-straight wall borders the playground on the green but, after due consideration, I'm ruling it out due to too much distance between the crinkle and the crankles. Judge and jury, me.